"Special occasion" to my daughter means twirly. 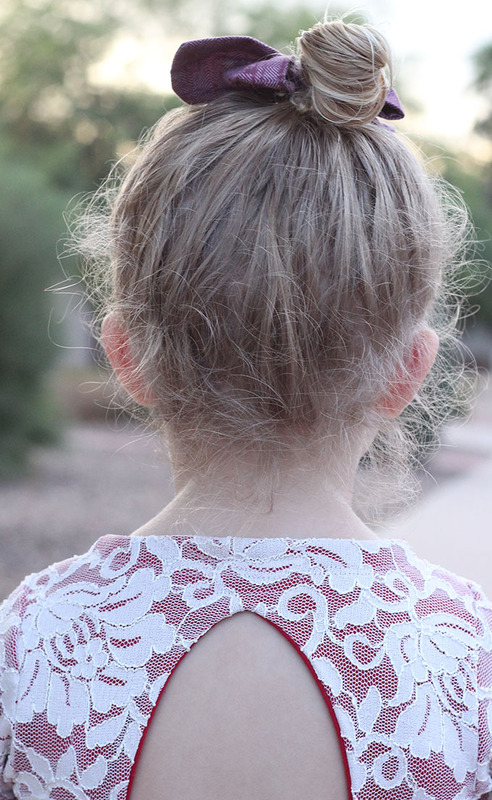 Anything she can twirl in is fancy and beautiful and all things wonderful in her eyes, so when I was invited to join this blog tour, my mind jumped to the Paisley dress. A full circle skirt, an open back and a smile on my girl's face? How could I say no? We're still in Summer mode here in Arizona with temperatures in the mid 80's. I had dreams of styling this so many other ways, more typical to the way one would naturally want to in November and December in the US, but decided to just be true to where we are and embrace how she will really be wearing it. Bare legged and fancy free! For this Paisley I used red ponte for the underlining and stretch lace for the top. Adding lace required almost no alterations for the pattern, except I finished the neck a bit differently, as I did not want a neck band which would make this look more casual. I actually wanted to fully line it for a clean finish at the neck but it would have been really bulky. I treated the lace and ponte as one fabric for the bodice, and at the skirt I just attached them at the waist. 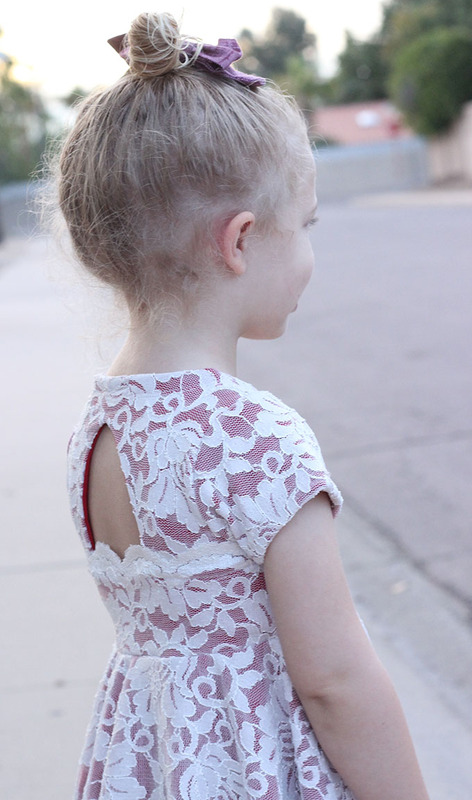 I used the scalloped edge from the lace on the back band, leaving it as an edge on the exposed back - I love that feminine look and think it adds a touch of elegance. My girl has been begging to wear this since I finished it and couldn't stop spinning once I got it on her. Safe to say its a win! The photos don't show it, but the lace has a sparkle to it, too, and I love how it looks when the light hits it as she spins. Safe to say its both mom and daughter approved, and sure to be amazing at our family Christmas gathering next month - and if she has her say, probably every Sunday at church and every day in-between until then! 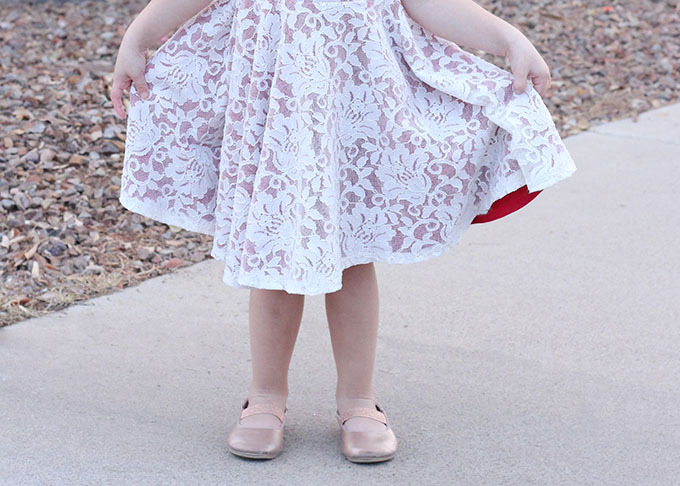 There are so many other beautiful dress patterns from Simple Life Pattern Co that are sure to put a smile on your little lady's face and will be perfect for your Holiday season this year, too. Whether its a small traditional family gathering or a snazzy shindig, check out their patterns and get sewing - and then link up because theres a giveaway! So be sure to read below about the two different ways to enter the giveaway - which is amazing - and checkout everyone else's incredible dresses because they'll blow your socks off! There are TWO ways to win in this giveaway! While both giveaways are open to everyone, contestants outside of the U.S. will be responsible for any excess shipping and fees and subject to the sponsors’ shipping guidelines. Already sewing for the holidays with Simple Life Pattern Company? 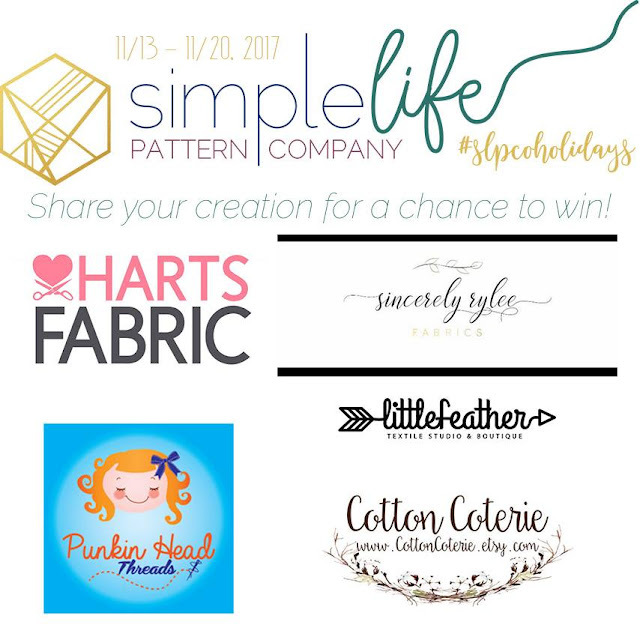 Share what you made for a chance to win the Link-Up prize! One winner will be chosen at random after the link-up closes. 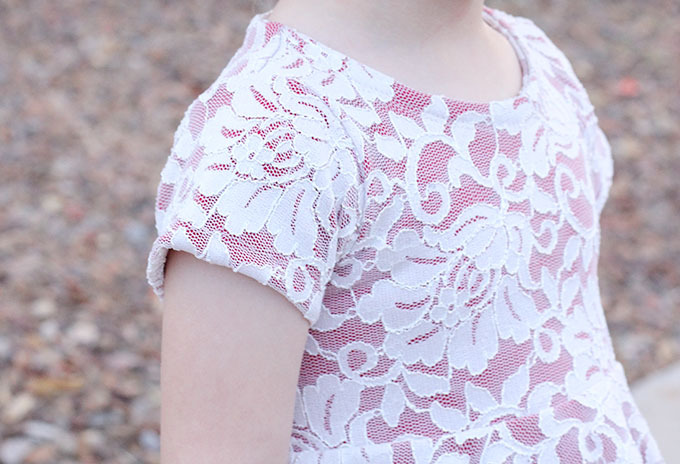 Paisley is one of my SLPco favourites and you gave it a true holiday - fancy dress touch. 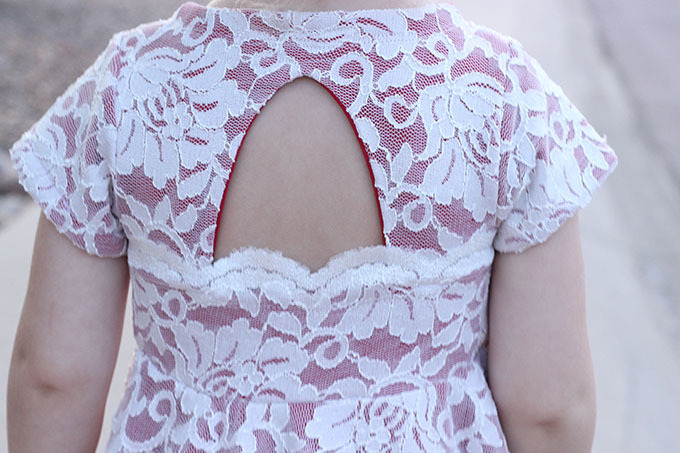 Love the lace. I think I need to pull this pattern out again one of these days. Oh, and nice thought on the neckline. I really love this version of the Paisley! I love how the bright red ponte really pops out and shows more when she twirls. Beautiful work! I a printing my Paisley TODAY. I have had it for ages, and you have inspired me. This is amazing. This is a really pretty dress! I love the addition of the lace. So beautiful! And twirls are definitely necessary for any special occasion! This dress is so perfect! It's twirly, girly and looks comfy too- all things that mean it'll get worn ALL the time! Love it!! Such a beautiful dress! I'm so afraid to tackle lace. You make it look easy! 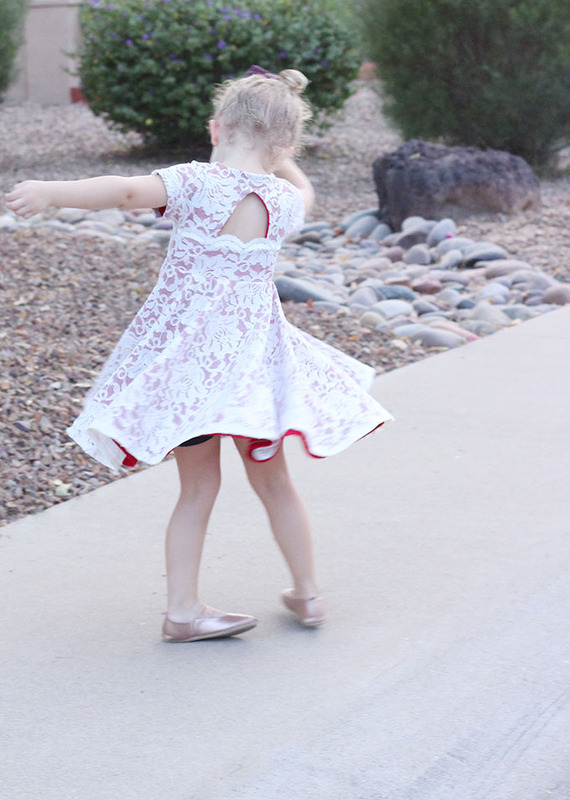 The twirl factor is important for us too!